Octavian and I recently returned from Berlin. He was there for an intensive ten-day philosophy seminar. I tagged along for the trip, unable to pass up the chance to spend some time in a beautiful, old city. We both, I think, had a marvellous time. The seminar, from what I gather, was one of those rare philosophical meetings in which the back-and-forth of argument, collaboration, and dissent was explosive, eye-opening, transformative of everyone's thinking in the room. (I'm pretty sure that this will bear out in no small part of the philosophical literature over the next ten years--I'm a little envious, anyway.) And my days in Berlin, though very different, were in their own right eye-opening, punctuated with moments of wonder. I wandered about the city, much of the time on foot, fumbling, trying, tasting wherever I could. But more on that soon, I promise. For the moment, I'd like to talk about being back. It's been hard for both of us to get back into our usual rhythms--to be awake and attentive when we should, to sleep much longer past 5 am, to cook for ourselves, to sit down to the writing we both need to do. More than once this past week, we've found ourselves falling asleep in front of the TV at 6 or 7 in the evening and without much appetite for cooking or eating. Much of this, of course, is just jet lag, but readjusting has really been a process after this particular trip. Maybe it's just that we're getting old. But it struck me the other day that, maybe, the hardest part about returning hasn't been a matter of time zones but people. In Berlin, we were surrounded by people, wonderful people. Since most of the seminar's participants weren't from the city, most of us found ourselves put up at the same hotel. So we'd sit with one another at breakfast every morning and chat sleepily over bowls of bircher muesli and plates piled high with vollkornbrot, eggs, and cured meats. And after the seminar wrapped up for the day, we'd find one another again and venture out into the city in search of a spot, preferably on a patio, to while away the evening over good, cheap food and cold beers. I loved this. Philosophy, you see, can be a lonely sort of pursuit. Sure, there are classes and reading groups and all sorts of spontaneous, informal discussion, but much of the work, the tangible stuff, I find anyway, is solitary. You have to sit down by yourself, for hours, days, on end, and decide what to make of all those conversations. You have to commit to something on paper and do it convincingly and clearly. And for that, you're mostly on your own. So I was happy to break from all that for a while and just hang out, soak up wisdom and swap stories and share laughs with philosophers who have become friends (most of us met for the first time last summer, in Chapel Hill, NC). And that, I realised, is part of why it's been so hard getting the hang of old rhythms again. It's been like the days just after two riotously fun, utterly memorable weeks of summer camp, only for grown folks who do philosophy. But luckily, one of the other seminar participants lives just down the street from us, and we'd already invited him and his partner over for dinner later in the week. So on Wednesday, we did our best to get back into the usual rhythms of chopping and stirring and slicing and baking. The dessert I put together that afternoon is one that comes from Pan Chancho, that venerable bakery from my old college town. 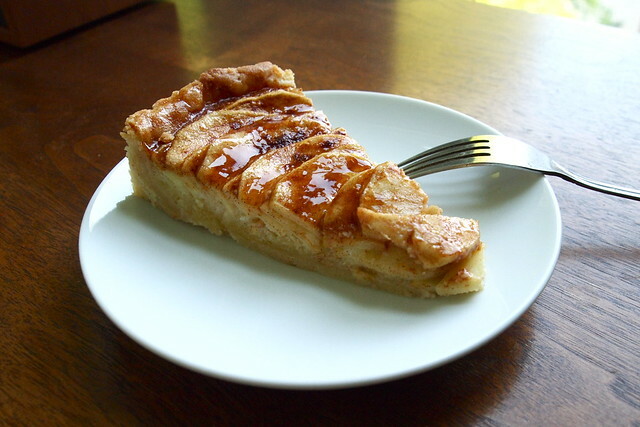 Friends, let me introduce you to the apple frangipane tart. It remains to this day the dessert of theirs that I adore most of all. Its thin slices of tart apple, slicked with a bit of apricot jam after baking, are perfect atop the velvety layer of frangipane, sweet and unmistakably redolent of almonds. And the short crust--I'm not sure that I've had better. When working your way through a slice, the best few bites are definitely the last, where apples and frangipane meet golden, crumbly crust just sturdy enough to hold it all together. I can't quite say why I decided on this tart for this dinner. But the thought and care it would take to make it--to blanch and grind almonds, to ready the crust, to slice the apples and arrange them just so--appealed to me then. It would be a labour, I knew, but for these friends a welcome one. To make the tart shell, cream the butter and sugar together in a small bowl until light and fluffy. In a small glass, combine the egg yolk and cream, then add to the butter mixture in thirds, incorporating well after each addition. Add the flour and salt, mixing just until incorporated. At this point, the dough should be pale yellow and rather soft, like cookie dough. Cover and chill in the fridge for at least an hour (or overnight). Place the dough on a floured sheet of parchment paper and roll it out into a 12-inch round, lifting the dough from the parchment occasionally to prevent sticking. Transfer to a 9-inch fluted tart pan with a removable bottom. Trim the over hang to half an inch and fold inwards to double the thickness of the sides. Seal any cracks with remaining dough. (Alternatively, gently press the dough into an even layer across the bottom and up the sides of the tart pan.) Pierce dough all over with a fork. Return, covered, to the fridge for 20 minutes. Preheat the oven to 400 degrees F. Butter the shiny side of a large square of aluminium foil and fit the foil tightly to the crust, buttered side down. 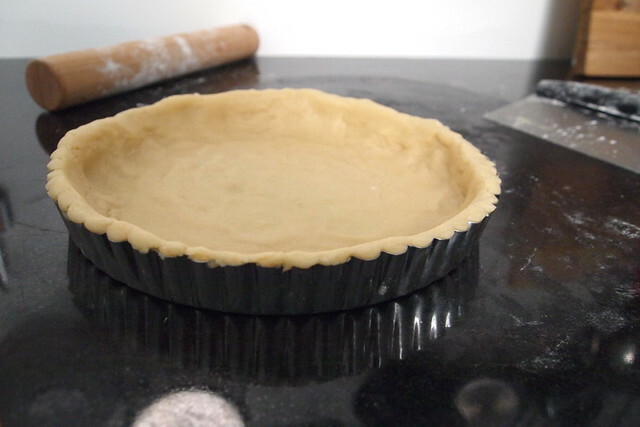 Fill the tart shell with pie weights or dried beans. Bake for 12-15 minutes, until crust is light golden in colour. Remove pie weights and foil and allow to cool for a few minutes. Then, brush the bottom and sides with a little beaten egg white. Allow to cool completely before filling. To prepare the tart for baking, preheat the oven to 350 degrees F. For the frangipane, cream together the butter and sugar in a medium bowl until light and fluffy. Beat in eggs, one at a time. Add the flour and almonds to the mixture and incorporate. Spoon the filling into the tart shell in an even layer and smooth the top. Peel and core the apples, then cut in half through the vertical axis. Cut slices, about 1/8 of an inch thick, from the halves. 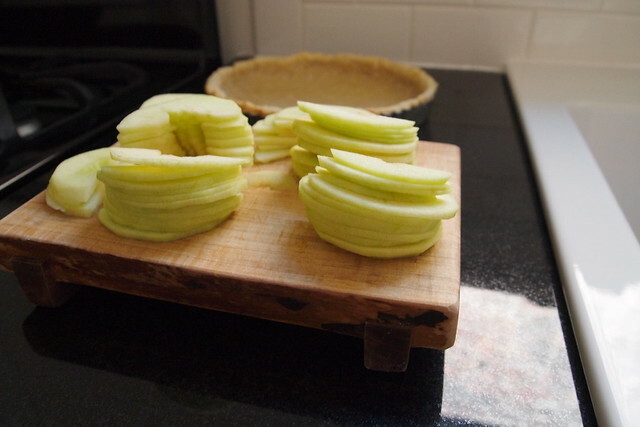 Reserve a few small, pretty slices to use at the centre of the tart--those are the ones that will be fully visible. Layer the remaining slices on top of the frangipane, working from the outside in. Finish with the reserved slices. Sprinkle with the cinnamon (it will look like an awful lot but not to worry). Bake the tart for 32-35 minutes or until the filling is firm but still moist--the tart will still wobble slightly in the centre. Allow to cool. To make the glaze, heat the jam and water in a small saucepan over medium-low heat, stirring until incorporated. Strain through a fine-mesh sieve, then return to the pan and bring it to a boil. While the glaze is still hot, brush over the cooled tart. Thanks, Melissa! Yeah, the apricots give the apples that pretty, burnished look to them, but aesthetics aside, the glaze is there to lend the apples a little moisture after their spell in the oven. It also adds some sweetness, but the apples are still fairly tart, which I think is important to the balance of the dessert. What a beautiful tart, Katie! 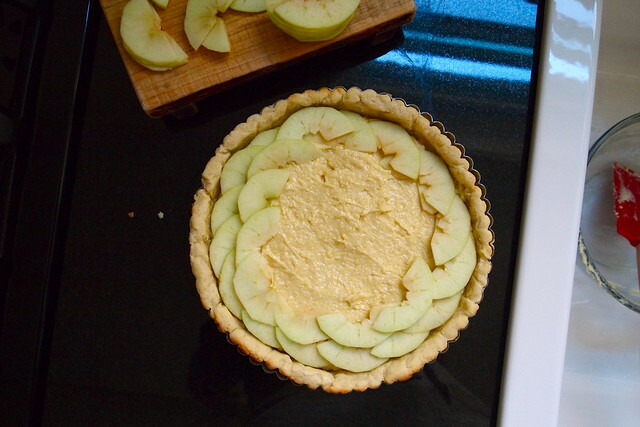 I've never seen frangipane paired with apples--sounds a bit odd to me, but now I really want to try it. And that tart dough! It look so perfect, and it certainly sounds perfect by the way you described it. I'd love to try out this recipe for shortcrust next time I'm making a sweet tart. Berlin is a great city. I'll have more to say about it here soon! 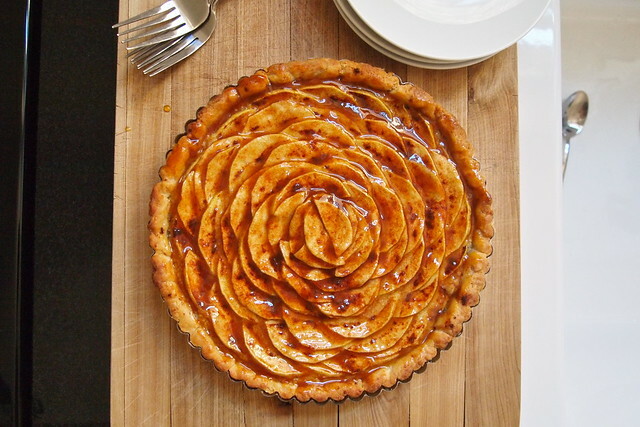 After reading the description of your tart, I feel like I need to go out and buy apples and almonds and make it as soon as possible. It is beautiful, and sounds so good. And it is good to hear that you enjoyed your trip to Berlin. Your days sounded much like ours, walking around and talking and eating. Lena, do let met know if you get a chance to make the tart! Berlin was wonderful. I wish I'd had more time there! I met up with some friends who were living in Kreuzberg for the summer, and they had the feeling that they could spend much longer just in that neighbourhood exploring. I feel as though I know Mitte pretty well, but much of the rest of the city is still completely unknown to me. Katie - I have so much to say and can relate to this post on so many levels. First, on being back, it is always an adjustment - the jet lag, the rhythms, the people, the place, the whole schabang really. It is a rare return when I don't feel lost or longing. Those times we travel are so wonderful and special and we are so absorbed when we are away, soaking everything in, that when we come back to the familiar it can be startling and unsettling. As you found, it is always helpful to dive into an engrossing kitchen project. You can cook your way back to home/normal/life. Second, on Berlin, which sounds like it was absolutely amazing. It is high on our list and we might even get there as soon as a few weeks. We've been waiting for the right moment, the right weather, the right airline prices. I'm also glad to hear that you liked the food. I've come to love German bread, sausages, breakfasts. Yum! 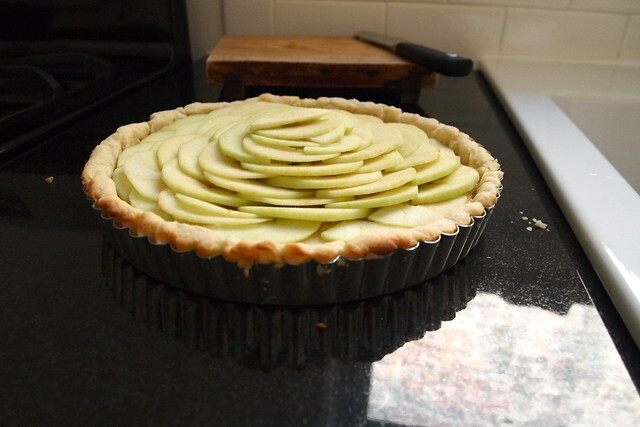 And Third, this tart looks AMAZING. Holy cow. I cannot wait to try it out. I'll probably host a dinner party just so I can make it. So beautiful. This looks so very impressive. 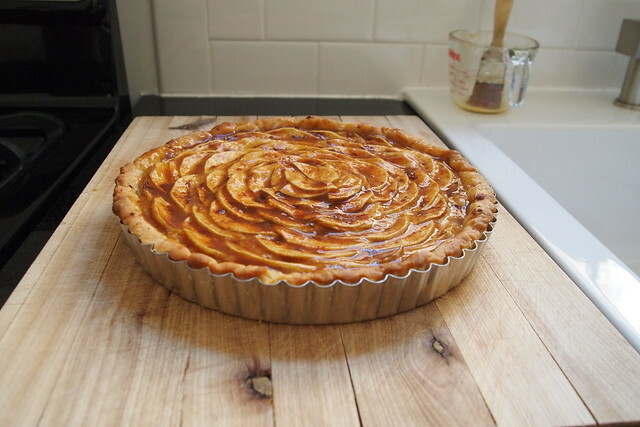 I recently made an apple tart with the very same apricot glaze on top, I love how it keeps everything moist and shiny. But the addition of the almond filling takes it to a very awesome place. I would assume the filling taste like marzipan? Happy I stumbled upon your blog.